Each year, the Mahla Pearlman Australian Young Environmental Lawyer of the Year is awarded to a young lawyer (under 35) who has made a significant contribution to environmental law, and to the community more broadly. 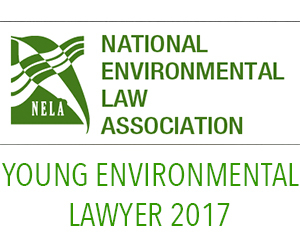 Nominations for the 2017 award close on 28 February 2017, and all NELA members are encouraged to consider nominating an outstanding young lawyer. For more information, click here. The award will be presented at the Mahla Pearlman Oration in Sydney on 9 March 2017. This year’s Oration will be delivered by Professor Jane McAdam, UNSW, addressing the topic: “Should I Stay or Should I Go? Shaping International Responses to Climate Change, Disasters and Displacement”. For more information, download the flyer by clicking here.